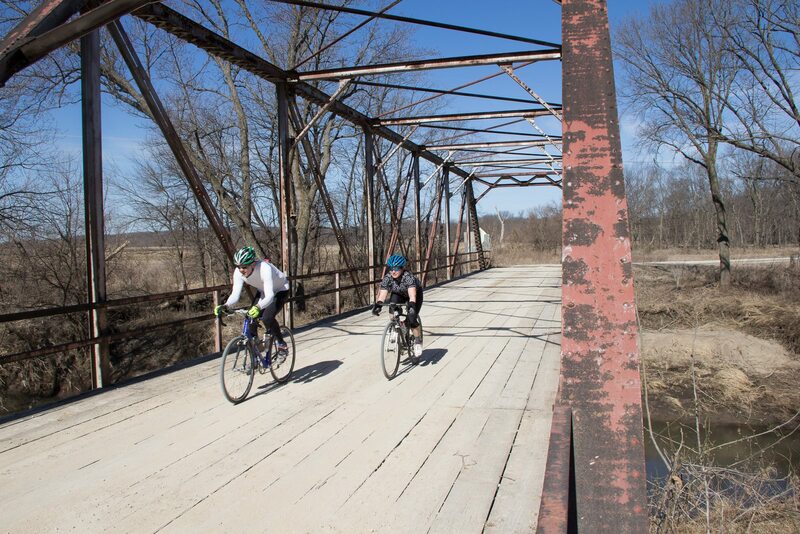 CIRREM is a legendary 100K gravel race in central Iowa, always held in the end of February. It is known for its roller coaster hills and finicky, temperamental weather. 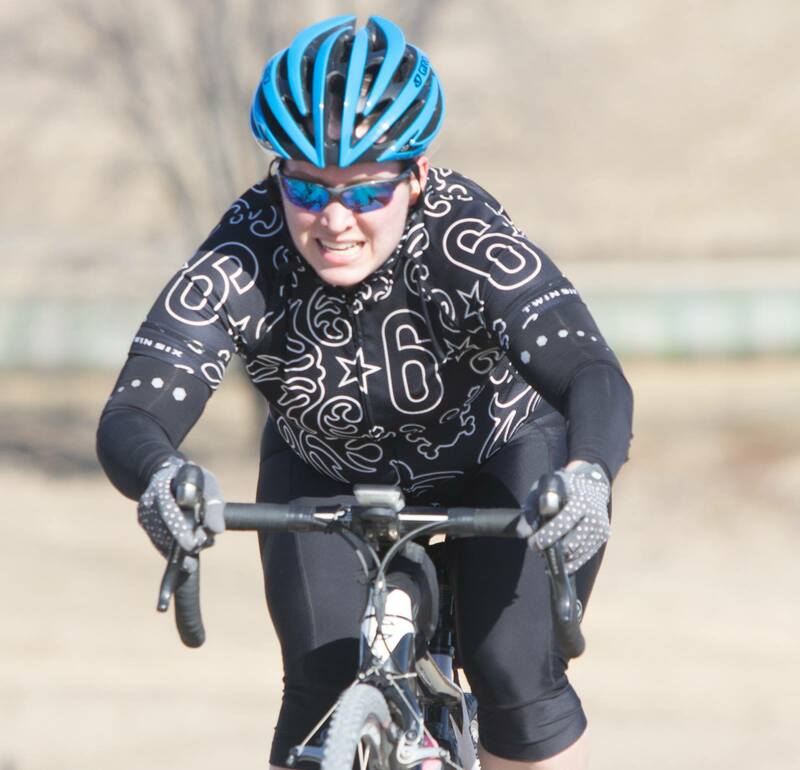 I naively attempted the race in 2014 after having consistently biked for only a few months. I had been on a handful of gravel rides, at most, and spent most of my training time indoors on a spin bike. 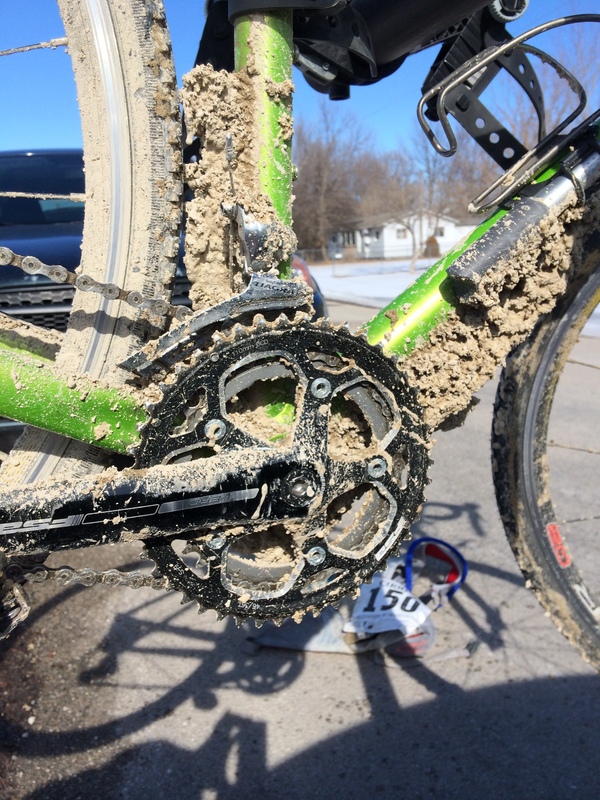 For the 2014 race, the weather produced a thickening slop as temperatures warmed and thawed the gravel roads. The muck splattered onto everything on the bikes, and as the crud dried it turned into a special kind of concrete-like limestone based substance. I stopped a few times to try and chip gunk out of my derailleurs using tire levers, but it got to be too much — I bailed about 20 miles in, humbled by the epicness of the course. However, I vowed I would be back for redemption in a future year. 2016 was that year. The destruction of my 2014 gravel rig, after only ~20 miles of CIRREM. Yikes! Temperatures hit record highs on Saturday. I had raced two weekends earlier at the Frozen Fatbike Forty where the starting temp was around -10F. By the end of CIRREM, the temperature crested to 70F. An EIGHTY DEGREE temperature swing over a two week period is rough for those of us that wilt in the heat! The gravel was smooth, packed, and FAST. My boyfriend asked if I wanted him to ride with me for the race, and I said yes. He’s been racing bikes forever so the “on course” advice is beyond valuable. I’m an idiot at drafting (see photographic evidence below), don’t know how to quickly notice and respond to attacks, and have trouble mentally staying with it during grueling races. At CIRREM I did better than usual on a few counts — I positioned myself at the front on the roll out (usually I’m lollygagging at the back chatting instead of strategizing), and also managed to chase down packs ahead of me multiple times (usually once I’m dropped I’m done for). Evidence of my inability to effectively draft … whoops. I was so focused on riding hard on Saturday that I couldn’t tell you what most of the scenery was like. My boyfriend told me later that one point we were even chased by a three legged dog, but I hadn’t even noticed! I was driven and determined to use all of my will to aim for a podium spot, but it wasn’t to be despite my tenacity. At one point I even achieved one of my cycling goals of forcefully puking, while grinding on the bike, and not getting any on myself and not stopping. Success! Oh hills. How I love to hate you. In a nutshell, the 2016 race was bittersweet. Sweet because I finished and finished FAST (just over 4 hours! ), but bitter because I continuously caught and got dropped by the pack that contained the ladies who eventually took 2nd and 3rd place. I had to settle for fourth. On Saturday both my body and mind weren’t ready — there are many excuses involving life getting in the way, winter depression, issues with dizziness and medications — nothing particularly unique or novel. However, I CAN say that fourth place on the first gravel race of the season feels very motivating! I was a minute or two from 3rd place. My legs aren’t even all that destroyed today, which tells me that my problems yesterday were issues with my “head” — fatigue, stress, lack of rest — and not necessarily due to terrible fitness. 😉 Time to regroup and gear up for the next race at Lakeville-Milltown-Lakeville in a few weeks. Thanks to Steve Fuller for the on-course photography!